Hormazd Narielwalla believes that ‘shapes created by and for a body long dead can give new dimensions, new perspectives for the living body.’ Fashion moves on and its templates are soon discarded, but this exciting artist uses the redolent remains to meditate on the human condition. Narielwalla’s practice began among the bespoke tailors of Savile Row, yet their classic brown paper patterns are not the only ones referenced in his unique collages and artist’s books. With coloured papers or acetate he brings vitality to venerable templates whether 1970s luxury lingerie designs (Lady Gardens), antique magazine inserts (Le Petit Echo de la Mode) or 1920s tailoring manuals (Hungarian Peacocks). 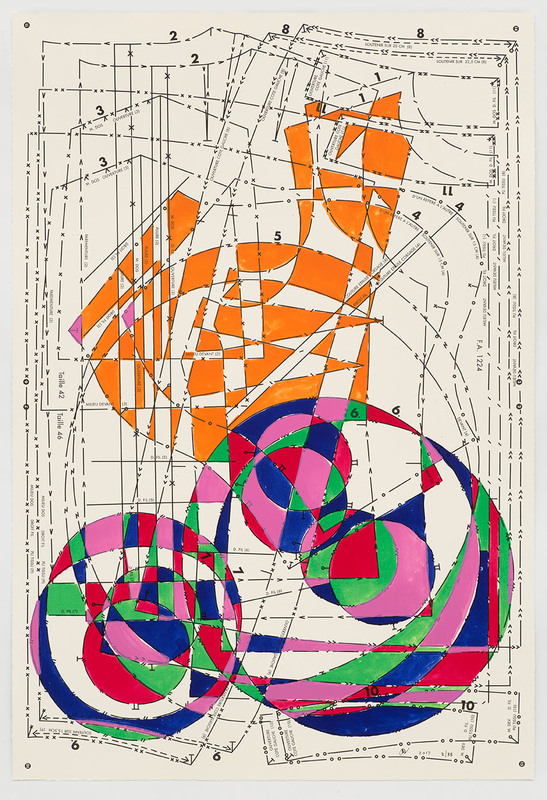 Freed from function these patterns can be seen as abstract drawings, and Narielwalla builds on the legacy of Cubism, to radically reinterpret the human form. A strong seam of historical reference and an appreciation of ceremony runs through Narielwalla’s work, whether his depiction of military uniforms from the Raj (Love Gardens) or more recently, British royalty. Last year Narielwalla released his most classical, contemplative work to date: in Negative Space three woodblock prints shimmer with gold and silver leaf, marking a daringly modern depiction of a female profile reminiscent of Picasso’s portraits of his muse Marie-Thérèse Walter. The profile is revisited in his 2016 homage to the British monarch, God Save The Queen, inspired by the quintessentially British art of philately. Just like the humble yet beautiful stamp, which travels the world on a paper envelope, Narielwalla’s work bears a global imprint. His fascination with human adornment also encompasses the traditions of West Africa (which feature in A Study on Anansi) and India (the collages of Body Architecture). In the latter work he pairs European dress patterns with Indian printmaking techniques and architectural conceits to suggest new multicultural identities.In view of Narielwalla’s fascination with the body it is no surprise that he also makes figurative works, such as the self-reflexive Oscar Hodgepodge series, or his celebrations of cult figures Klaus Nomi and Frida Kahlo. His irresistible humour comes to the fore in the Pretty Boys series, which celebrates the dandies of East London. The viewer of Narielwalla’s work can expect to witness elegant yet subversive play with notions of gender, geopolitics, time, and – in paper sculptures such as Memento Mori – even dimensionality. These artworks are always as incisive as they are beautiful.